Try us out before committing to a membership. Ready to upgrade your active life? Take the first step, it’s easy and 100% free. We offer performance psychology workshops and sports nutrition clinics for teams and individuals. Combining team building opportunities, competitive drive, and strength and conditioning gains. Thanks for the great training. I’m still amazed at how how much my skating has continued to improve and how rapidly, and I am looking forward to making more progress going forward. Advantage Sports Strength and Conditioning has been a very rewarding and challenging training program that has made me a better hockey player in every aspect. Brian is both a coach and motivator when it comes to pushing yourself to improve. I have learned a lot about how to condition my body to play at the highest level in my sport. The Performance Strength Program can make you a better player by preparing you physically, and pushing you mentally. I recommend Advantage Strength to anyone who wants to get bigger, faster, stronger and smarter. I am a 50-something adult figure skater. About a year ago, I started to notice that my athletic performance was declining, both through age and lack of attention to my physical condition. I was referred to Brian Sipotz at Advantage Strength for help. Brian has been my personal strength coach for over half a year. What a difference he has made in my life in just six short months, both athletically and health-wise. My skating performance is clearly more powerful than it has ever been, and my confidence level has increased dramatically. And an unforeseen benefit — I’ve added lean muscle to my frame and trimmed down significantly — a huge bonus for a middle-aged woman struggling with weight gain. Brian is amazing — and a great guy to work with. Brian, I am a true believer in your approach. Thanks for helping me summit Mt. Rainier (14,700 feet) this summer- with your help I am ready for Everest base camp and lots of hockey. We loved our Mental Mornings days; best days of the week by far! We had so much fun together, and Cari grew a lot as an athlete during the few months that we worked with you. Thanks so much for a truly inspired experience!! After spending 30+ years coaching power skating and training athletes, I am truly impressed with the level of coaching competence at Advantage Strength and Conditioning. Brian and his staff do an exceptional job of taking into account the age and level of every athlete that comes through the door. By designing and implementing age and level appropriate programs, Brian successfully assists all of his clients with their athletic and personal fitness goals. More importantly, Brian and his staff achieve results through a safe, no-nonsense strength training philosophy where everyone from elite athletes to older adults and are challenged with scientifically based workout methods. I don’t know of any other facility or strength coach in the Ann Arbor area that offers such an amazing comprehensive workout platform. Mental Mornings was so much fun! It was nice to have a jump start to my day before school. It woke me up and gave me energy for the day. It warmed up all of my muscles and bones. It was challenging, but it always paid off. Advantage Sports helped me get more fit and better at my sport (hockey). The coaches were always so nice, and they always supported and encouraged me. I learned a lot every time every time I went. Each day was a different workout with new challenges, and that made it lots of fun. Mental Mornings rocks! 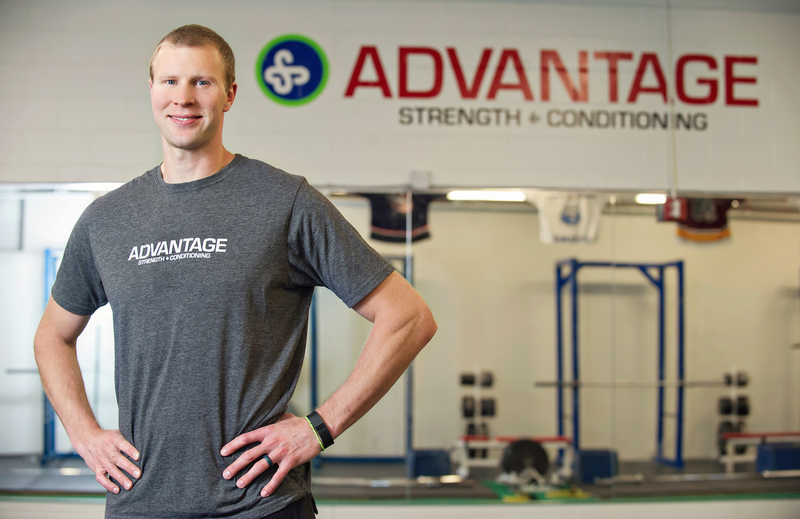 Advantage has helped me train and get in shape prior to and during the hockey season, and outside of that it has expanded my knowledge of physical fitness and the impact that it has on a person’s life. The coaching staff at Advantage is great at not only teaching the proper form of how to do an exercise, but also to explain the benefits of said exercise in everyday life, and in an athletic performance situation. The strength program I participated in was great, and very challenging which helped me grow physically and mentally. Advantage Strength is for everyone. Whatever your age, whether you are an elite athlete or just starting out, this coaching staff will help you reach your goals. The training is interesting, challenging, and fun, and the coaches give much thought to efficient workout techniques that are accessible and adaptable to all ages and skill levels. The environment at Advantage is always welcoming and supportive, and there is great camaraderie between students and coaches. As an adult with no previous sports training I have been amazed by the progress I have made in less than a year. I couldn’t have done it without the coaches at Advantage! Join our Insider’s list and we will keep our best stuff coming right to your inbox.